UHA originated in 1998 following a national election and a new government coming into power. Anticipating significant changes to the NHS as a result, chief executives from the largest multi-specialty trusts formed the UK University Hospitals Forum to discuss and prepare for these changes. All of these trusts had strong involvement in research and undergraduate education. The forum sought support from the staff of the Council of Heads of Medical Schools (now Medical Schools Council) and it was agreed that staff would provide policy and organisational support to the forum. The forum had one large meeting per year with attendance from the most senior figures in the NHS. Across the 2000s, membership widened to include single-specialty trusts such as those focusing on oncology, ophthalmology and mental health, as well as paediatrics. Expanding the membership while retaining a focus on the common issues of specialty trusts allowed the organisation to harness the experience of many voices. Affiliate groups were formed to provide national collaboration in particular areas of members’ work. Directors of nursing, human resources, research and development, and medical directors now met several times a year, joining the finance directors who had been involved from the beginning. The experience and technical knowledge of the organisation increased as a result. In 2019 the organisation became the University Hospital Association. While the broad issues in the health service are similar to those of two decades previously, the working environment and funding streams can be very different. 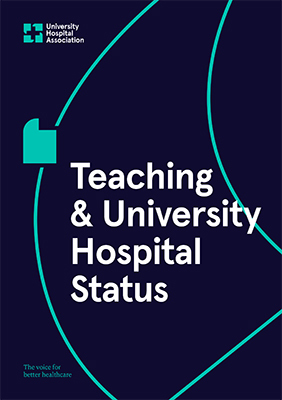 The increased complexity of care, combined with ever tighter budgets, means the national voice of university hospitals has to be more collaborative – and more assertive – than at any previous time.